When you hail from an area that prides itself on remaining fruit fly free, you understand the concept of quarantine. Imagine your father works for an organization whose prime objective is exporting fruit – welcome to my world of neurotic quarantine. We grew up with a very heathy respect for keeping Australia free of the bugs and diseases that it had managed to avoid by being an island. This is something that I have carried on to my own family, they are vigilant when it comes to flying into Australia. On a recent flight home, G spotted a woman spitting the seeds from a piece of fruit she’d eaten into a plastic bag (a crafty plan for reproduction) and he dobbed her in. I giggled at his excited nature when he told me how he’d implemented the sting, but I was secretly very proud of his diligence. I’ve watched fellow travellers get stopped at customs and sheepishly produce a weeks worth of food for a family of 8. Legs of meat, fruit and vegetables are stuffed into the sides of suitcases and tucked away at the bottom of bags. I’ve watched as people have tried to argue about why they should keep the small tree they’ve carried half way across the world to plant in their garden, and then given an approving wink to the customs officer who has explained why it can’t happen. Blame my father. What I hadn’t realized in my early expat years though, is that it was highly possible that it may be me, who was the next quarantine item. With the increase of international travel, expats have learnt that it’s now not only what you bring in, but who you bring in. We are now in a situation where it no longer becomes about your luggage or your lunch, it’s your temperature and your cough. Mention the words swine flu or SARS to an expat and they will immediately duck for cover. “Do you have the shoes that you wore?” I explained that they were back in Jakarta, and after an inspection of both the shoes I had on and the ones that were in my suitcase, I was ushered through. In Libya, when SARS hit the news, our Canadian friends found themselves exploring alternative options for Christmas. They were told they had every right to leave, but there was no chance of returning back into the country. Losing your job can throw a bit of a dampener on the Christmas spirit – so they chose to stay. We were all impacted by SARS that particular year, body temperatures were scanned through many airports in South East Asia and no-one dared to cough. I looked into the little traveller’s eyes as we made our way through Singapore “Whatever you do, don’t sneeze”. In Texas the children learnt a new set of skills at school. How to cough into your elbow and washing your hands like a heart surgeon, became a daily discussion when Swine Flu became prevalent across the border. On a trip to Australia a few years ago, we were contacted by the Queensland Health department after the third little traveller had burst into a colourful case of fifth disease or “slapped cheek”. When Grandma had mentioned to the doctor that we’d flown in from Texas, warning bells sounded. G was then taken through a half hour interview about our dealings with Mexico and who we’d had contact with. We didn’t mention our weekly catch up for tacos and magaritas with our Texmex amigos, we didn’t think they’d see the humour. And now I sit here wondering if we are on the brink of the new elbow coughing phenomenon. I’m not concerned, but I’m certainly watching the news of a Qatari man critically ill with respiratory problems in London very closely. He’s linked to another man who has now died of the same condition. The New York Times tells me today that it is not SARS (but it’s from the same family) the good news is that it “does not appear to be easily spread from person to person”. In the back of my mind is a little voice saying “Are you sure you should be going home for this operation? Maybe you should take the children? Don’t risk you being in Australia while they’re here on a travel ban.” And then a louder voice comes in, the voice of expat reason, the one that always drowns out the little voice with a simple “settle down, you’ve been here before, don’t over-react”. I need to put those little voices in quarantine until Christmas, they need to stop at the boarder control of common sense and logic. 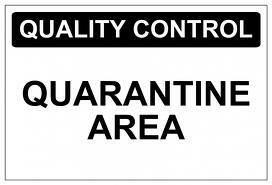 Have you ever been quarantined?